The Remote For My DVD/VCR Combo Will Not Operate Properly. For your remote to operate correctly, you must put it into the proper mode using one of the mode buttons. There are three mode buttons on the remote: DVD,VCR, and TV. Press the mode button for the device you want to operate before you use your remote to operate the device. DVD Button: Press the DVD button on the remote control when you want to control the DVD player. The DVD indicator goes on in the Front Panel Display to show that you have selected the DVD player. VCR Button: Press the VCR button on the remote control when you want to control the VCR deck. The VCR indicator goes on in the Front Panel Display to show that your have selected the VCR. 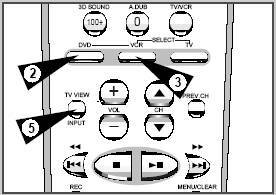 The TV View Button: Press the TV VIEW button on your remote repeatedly to cycle through all of your input sources, including the DVD, VCR, Tuner (Ch##), Line 1 (front AV input), and Line 2 (rear AV input). Can I Convert My VHS Tapes to DVD? Get Snow/Static When Trying To Use My DVD-VCR Combo For The First Time. How Do You Fast Forward A DVD on the DVD?